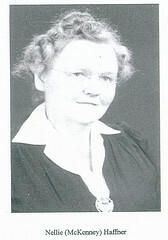 Nellie Adelaide McKenney was born December 24, 1902 in Pine County, MN, and died January 24, 1954 in San Francisco, CA. She married John George Haffner October 22, 1921 in Billings, MT. He was born February 22, 1897 in Arad, Hungary, and died February 02, 1975 in Salt Lake City, UT. Gold halos for the are lites make. The town clock tolls the midnight hour. In travail. Now she quiet lies. Of April’s feeble newborn cries. This poem was copywritten by the Curtis Publishing Co.